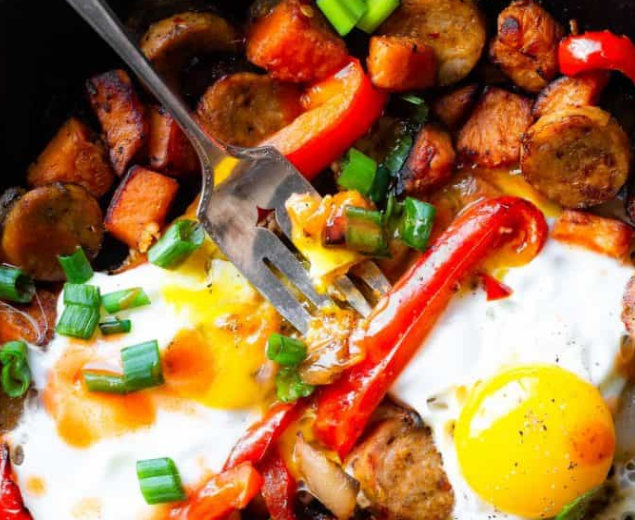 This buffalo chicken Paleo Sweet Potato Hash is a game day spin on a classic breakfast! It’s quick, easy and paleo and whole30 compliant too! Place them a pot of boiling water and cook them until JUST tender. This is the SECRET to making the best sweet potato hash as it allows the insides of the potatoes to cook without the outsides burning. Add the potatoes and vegetables into a hot frying pan with oil and cook until golden brown. Then, add in your sausage and cook until brown. Bring a medium pot of water to a boil and cook the cubed potatoes until they are just fork tender, about 3-4 minutes. In a large pan, heat the olive oil up on medium heat. Cook the potatoes, onion and red pepper until lightly golden and soft, about 4-5 minutes. Add in the garlic, chicken sausage and salt and pepper. Cook, stirring often, until the sausage is lightly browned. Let sit for 5 minutes to caramelize the bottom. Sprinkle the grated cheese on and stir to mix it into the potato mixture. Make two wells in the hash and crack the eggs into them gently. Cover and place into the oven until the eggs are cooked as much as you like them. I like my yolks runny, which took about 4-5 minutes. Drizzle with buffalo sauce and diced green onion and serve.